We’ve all heard of attention deficit disorder, but how about nature deficit disorder? If your child lives in the city or suburbs, research shows they’re at risk. But it’s okay – we have the cure! It’s WilderQuest, a new website and iPad app from the NSW Government that’s designed to help kids, especially city kids and their families, experience nature and inspire them to spend more time outdoors. NSW Environment Minister Robyn Parker launched WilderQuest in Sydney’s Royal Botanic Gardens today, with the eager help of students from a local primary school. 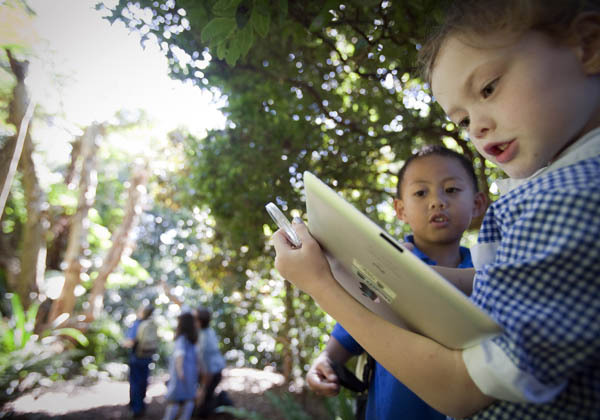 In something of a paradox, WilderQuest uses fun interactive games to help kids learn about the native animals and environments they’ll find in NSW national parks, from the rainforest and mountains all the way to coastal areas. The idea is that the online experience will encourage and inspire kids to take their virtual adventuring outdoors into their own backyard or the local park. Parents are also encouraged to get involved by visiting national parks with their children to tackle official WilderQuest Discovery activities. It’s a worthy project, especially when you consider official statistics show that one in every two children aged between five and eight in NSW have less access to natural spaces because they live in the greater Sydney metropolitan area. Plans are already underway to link the WilderQuest program into NSW classrooms so parents and teachers can share the experience. We’ve had a play with the app and are impressed with the simple format, which literally turns your home into a forest. By engaging with your child as they play the game, it’s easy to see how you can make an outdoor trip an enticing prospect. Designed for five to eight year olds, children can begin their WilderQuest adventure online or with the free WilderQuest iPad app available from iTunes.